War, peace and the American military machine. One day when I was 9, I came home to find my normally unflappable mother pacing and white-faced. “We invaded Grenada,” she blurted, and began to cry. It took me a few minutes of frantic synapse work to piece together that the serious media proclamations I’d been hearing were connected to my mother’s emotional outburst, and to reassure myself that Grenada was in fact pretty far away and was not actually going to affect us personally. “It’s going to be ok, Mommy,” I responded feebly. I was wrong, of course. I was reminded of this long-ago episode while looking back through 40 years of In These Times’ foreign policy coverage. Less than a month after Operation Urgent Fury crashed into that island nation of less than 100,000 people, ITT published a round critique of U.S. policy toward Grenada. In the November 1983 article “Administration sees invasion as triumph of U.S. military will,” John B. Judis discounts White House and Pentagon justifications for the invasion. He concludes that Grenada still “fit [Reagan] administration designs perfectly” because it gave the military a chance to flex its muscle and send a message to nations waffling on Communism. The invasion was a tiny blip on most screens, but to ITT readers, it continued decades of anti-Communist adventurism and bitter violence in the Caribbean and Central America. At every turn in this bumpy four-decade ride through extractive and exploitative foreign policy, this publication filled in the picture, connected the dots and complicated the narrative through an unapologetically leftist framework. After Sept. 11, 2001, that mess was overlaid with the War on Terror and boom, the results are airstrikes abroad in at least seven different countries, a new stream of refugees desperate to escape violence and economic instability, hateful backlash against Latinos and Muslims, and a hyped-up audience for Donald Trump’s wall-building and hate-mongering. Islamophobia, the war in Syria, desperate refugees paddling toward asylum at all costs, war in the Middle East: These are all covered in the mainstream media as ahistorical phenomena, like weather. But through the pages of this magazine, we can trace a path of cause and effect. These are not deep-seated, irreconcilable tensions rooted in religion and ancient enmities, but life-and-death resource struggles. A 1984 investigation relates Palestinian farmers’ heartbreak over the destruction of fig trees, olive groves and wheat fields by Israeli construction crews, and in September 1991 Staughton and Alice Lynd tell us Israel controls 60 percent of the West Bank's land and is diverting water illegally. ITT continues to cover the Palestinian struggle: In an April 2009 debate on the efficacy of Boycott, Divestment and Sanctions against Israel, both Naomi Klein and Rabbi Arthur Waskow are grounded in an understanding that money—specifically, American money—helps perpetuate the occupation, despite their strategic disagreement. This early attention to the political versatility of the word has made ITT particularly effective in the post-9/11 world. ITT’s war-rhetoric radar was attuned as world leaders rushed to tar every threat as terrorist in order to gain U.S. support for their pet invasions. Peace and anti-war movements struggled to maintain a sense of global solidarity and restraint, and turned to this magazine for guidance, connection and insight. Woven through all of this are U.S. economic interests operating hand in glove with political interests. We see this right up through Operation Enduring Freedom, the Bush administration’s invasion and occupation of Iraq. While many in the peace movement focused on the wrongness of the invasion—no weapons of mass destruction, no connection to 9/11, no nuclear smoking gun—Antonia Juhasz, in a January 2007 ITT article, quotes the CIA’s senior expert on al-Qaeda, who quit in disgust in 2004, saying, “The U.S. invasion of Iraq was … an avaricious, premeditated, unprovoked war against a foe who posed no immediate threat but whose defeat did offer economic advantages.” Smack down! Juhasz then explains how the U.S. got its hands on that sweet Iraqi oil, negotiating the U.S.-Middle East Free Trade Area with a shocked and awed region in no position to deal from strength. When it comes to who’s a terrorist and whose human rights matter, why does the United States get to be the great definer? Our bloated nuclear arsenal can’t hurt. In These Times sees this more clearly than most and covers nuclear weapons, nuclear power and the anti-nuclear movement with considered depth. As a child of the anti-nuclear movement, I particularly appreciate the reporting—foreign and domestic—on that movement’s tensions, shortcomings and victories. Here it is, covered like what it is—news! This point was driven home by a series of articles about the merger of two very different anti-nuclear organizations in 1987. It is not quite the breathless coverage of Bayer’s bid to buy Monsanto, but the pros and cons of consolidating FREEZE’s strong grassroots presence and ability to mobilize thousands with SANE’s more top-down, Beltway-focused expertise are weighed and debated within ITT’s pages over several months, culminating in December 1987’s “The Sane/Freeze Merger” by Dennis Sadowski, which recounts the 201-1 vote to merge. ITT also appreciates that the anti-nuclear movement goes beyond the superpower capitals. 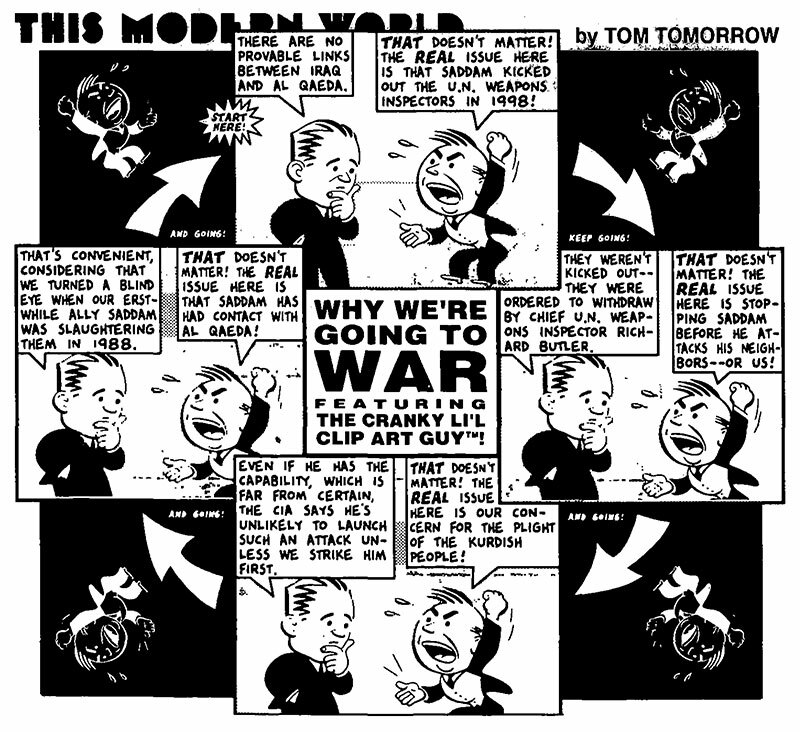 In the October 1983 article “Third World Crisis is Nuclear Trigger,” James Petras and Morris Morley express frustration that Western anti-nuclear activists weren’t centering the concerns of those in the Global South, who, the piece argues, are likely to suffer most in the next nuclear war. This message has been carried through the decades and, thankfully, heard loud and clear by the international activist community. As a resident of the Submarine Capital of the World—Groton, Conn.—my favorite nuclear article (never thought I’d write that phrase) is “Daze of Dolphins” by Joel Schechter in June 1990, a tongue-in-cheek imagining of a World War III started by dolphins trained to protect nuclear subs, who use their snout-mounted guns to take over Moscow and Washington. We still have to laugh; ITT gets that. Four more years of empire? Big media has changed in the last 40 years. It has consolidated, constricted, gotten faster and more superficial. But the tendency to tell only one story at a time has not changed. I am happy to report that In These Times bucked this trend. There are so many stories here—from every corner of the globe. Richly reported, full of vivid detail and embroidered with critique and hope. That attention to the craft of reporting and writing must be maintained even as the public’s attention span degrades. 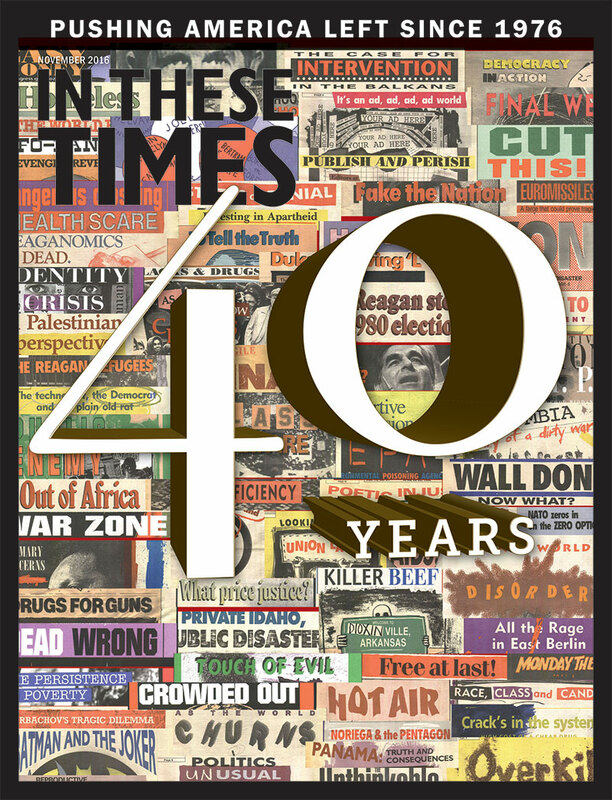 Looking forward 40 years, what will we need from independent progressive media? A perpetual wake-up call! Even the most horrific tragedies get old, and we need to be reminded to keep paying attention to Afghanistan—you know, that war we’ve been embroiled in for the past 15 years. How about abuses of executive power, torture and indefinite detention, bombings? We need a call to rebuild a peace movement that can take on all of this—and so much more. Today’s wars are fought with fewer and fewer actual U.S. soldiers; our robot assassins and vaguely defined enemies have blurred the battle lines, probably permanently. These wars involve and implicate all aspects of societies—culture, economy, civic institutions. But the problem is still U.S. militarism—gargantuan, expensive, brutal. What are its weaknesses? What are our tools? How can we organize so we need less from a state whose policies we deplore? We still need a steady (but not rigid) framework for understanding an ever-evolving world, an ever-shifting political landscape and a set of economic principles that are on perpetual (and very expensive) life support. We still need a platform to cover people and struggles—not just issues and countries—and to hold those people and struggles accountable. We still need a magazine that connects readers emotionally to foreign policy. Because the invasion of Grenada did affect me personally, I just didn’t know it when I was 9. Frida Berrigan is a senior program associate with the New America Foundation’s Arms and Security Initiative and a member of the Campaign for a Nuclear Weapons Free World.